The concept of corporate governance has come under intense public scrutiny in recent years. Business people everywhere are asking: What exactly does ‘good’ corporate governance entail? Which aspects of it are legally binding, and in what ways is it merely a set of expectations on how corporations should be organized ideally? Nowhere are these important questions answered more precisely - nowhere are the lines more clearly drawn - than in the insightful synthesis of statutory law, case law, and organizational theory presented in this book. defensive tactics in case of a hostile public takeover bid. These problems - and many others - are examined in the light of corporate governance codes and guidelines and of reports and judgments that deal with specific instances where investigators or courts were asked to analyze corporate governance issues in concrete cases. Each of the ten chapters includes in-depth analysis of such cases. A special feature of the book is a set of model corporate governance guidelines based on US corporate practice. Corporate Governance as a Limited Legal Concept is remarkable for its very thorough characterization and definition of corporate governance as a legal concept, as a code of conduct, and as an organizational structure. 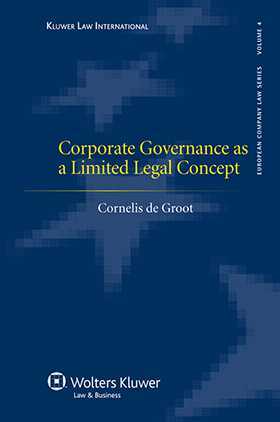 The author’s clearly reasoned analysis of the legal limits of corporate governance will be of great interest and practical value to business people and their counsel in any jurisdiction.